To boldy go where no walking dead has gone before? 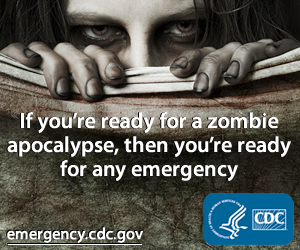 We ain't 'fraid of no reanimated corpses? Now I must warn you fellow geeks, clamp your mouth shut and try to prevent drooling (it's hell on keyboards) because Captain Kirk and the crew of the U.S.S. Enterprise, G.I. Joe, the Ghostbusters and the Transformers are all joining together in an epic comic book crossover event to battle zombies. This initial 32-page story begins in IDW’s own ZOMBIES VS. ROBOTS universe, where something goes terribly wrong and ultimately infests the worlds of TRANSFORMERS, STAR TREK, G.I. JOE, and GHOSTBUSTERS with zombies and infected robots. From there, the story spins ferociously into each of the four properties throughout February and March, and culminates in April’s bombastic finale, INFESTATION #2. 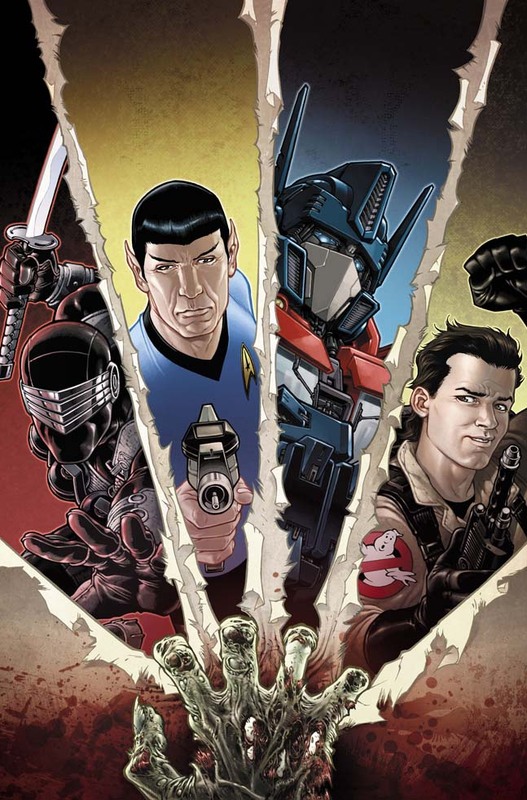 In February, TRANSFORMERS: INFESTATION #1-2 and STAR TREK: INFESTATION #1-2 will ship bi-weekly. The TRANSFORMERS title will also be written by Abnett and Lanning, with fan-favorite Nick Roche handling the art. STAR TREK will be written by mainstay writers Scott and David Tipton and illustrated by Casey Maloney (Zipper). March will see the release of the bi-weekly G.I. JOE: INFESTATION #1-2 by writer Mike Raicht and artist Giovanni Timpano, as well as GHOSTBUSTERS: INFESTATION by Erik Burnham (THE A-TEAM: WAR STORIES) and Kyle Hotz (Marvel Zombies). No doubt such a high-concept crossover will be hard to pull off, but I'll certainly be reading. Of course, we can all safely assume anyone named Snake Eyes, Venkman, Optimus and Spock will survive the zombie attack, but I sure wouldn't want to be a Red Shirt in that world.